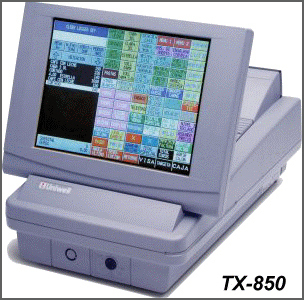 The new TX-850 is the reply from UNIWELL to the market where the demand for a touch screen system has long been rising day by day. People want to have a touch screen system, because the operation is so easy that the training time required is reduced drastically and better customer service can be realized. 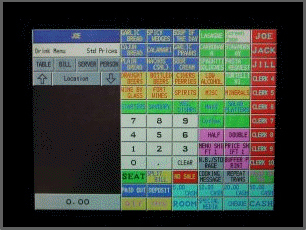 Designed to meet with those requirement from market, and taking best advantage of ROM based engine, TX-850 is featured in better cost effectiveness and stability than PC based PoS. Enhanced software, based on UNIWELL's HMS-Hospitality Management System - written in "C" Language, allows easier software modification locally in any marketplace. The system meets the requirement from various hospitality industries of wide range. With a simple touch on the screen "Wide 10.4", 256 colors, VGA (640 x 480)on front display, an operator can forward his operation with ease and speed while confirming each key sequence physically by his own eyes and fingers. For complicated menu such as a full course dinner composed by many choice and options, the system gives full play to reduce the transaction time to a minimum by presenting the optional items only as a new "keyboard" after selecting the intended course by ONE TOUCH. Compact cabinet size (W 300 x D442 x H 248mm) provides you with valuable space saving in the busy counter area and very sophisticated and refined appearance on this model. Standard Interface with 1 x RS-485 and 3 x RS-232C to which, PC, remote receipt/kitchen/slip/report printer, bar code scanner, magnetic card 1st/2nd drawer are connectable. As a total solution package, "Stock Master" series and "EPoS Manager" (Windows based back office software) are also available.